At Barrington Hall we provide yacht charters around the world on motor yachts, catamarans and monohull sailboats. 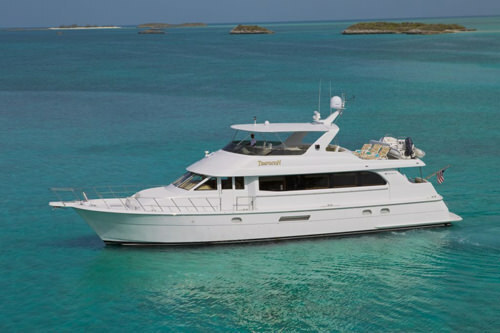 The Power Yacht listed below, TEMPTATION, is one of the many yachts we offer for charter. Please contact us for up to date information on TEMPTATION or any other yachts in your desired location. Accommodations: TEMPTATION can accommodate 6 guests in 3 cabins. As a 100 ton licensed Captain, Joels goal is to provide the best in care, enjoyment and excitement aboard Temptation. Born and raised on Staniel Cay, he spent his entire life in Boating and is an excellent fisherman and diver. Local knowledge is a must in the Bahamas and he knows every inch of these islands and will show you special hidden treasures many people have never dreamed of. Chef-Stewardess - Currently hiring freelance.